Distinguished Guests, Ladies and Gentlemen, good morning! It is my honor to be here today, I am the CEO of an international development consultancy called Rui Na Xin (Development Reimagined), and the former deputy country director for UNDP here in China. Today I have the great pleasure to share opportunities for China’s logistics companies and other stakeholders to invest and create partnerships in African Countries and thereby deliver on China’s Belt and Road Initiative, first announced in 2018. But before I share those opportunities, let me share with you why I believe such partnerships are important, and what needs African countries have. The African continent is now the home of 395 million poor people, the world’s majority. The continent has the largest number of landlocked countries in the world. And, there is a correlation between logistics and development. As a result, or as a reason, trade volumes to and within the continent are also very poor. 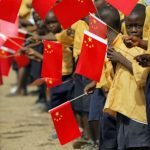 Africa accounts for less than 4% of China’s trade, the same for the US. Even within the region, only 10% of trade is inter-African trade. There are similar patterns in terms of overseas investment. It’s improving but not fast enough to catch-up with the rest of the world as yet. First, African countries are committed to green growth and industrialisation. I was pleased to hear yesterday about the work of Chinese companies to promote green transport. African governments need this, and they are also creating special economic zones often in partnership with Chinese local provinces and contactors. All of these should be helpful for growth, jobs and will need logistics. Second,African countries –although government leaders are old – mostly have young populations, who are very dynamic, entrepreneurial and ready to work and consume. In a recent expert survey, 32% of respondents suggested that the main driver of logistics growth in the continent is the growth of the middle class, which is rising rapidly. Africa’s population is currently 1 billion people, but by 2050 will have 2.5 billion – compared to China at only 1.3 billion, and India at 1.7. There is a huge potential market there. Third, Africans are also technology savvy. Witness the use of mobile banking across the continent. Mobile phones are used for all sorts of needs – by farmers and city dwellers, and many new apps from healthcare to music are developed in country, by clever young programmers. These needs and three factors presents great opportunities for Chinese companies. 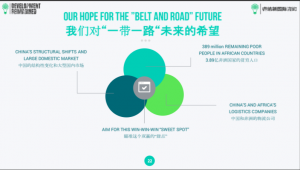 And then, from the China side there is the Belt and Road Initiative (BRI), which determines China’s increasing international footprint and focus. 12 African Countries so far have signed overarching Memorandums Of Understanding with China on the BRI, while 6 are members of the Asian Infrastructure Investment Bank (AIIB). It means there is a real opportunity for China to shape and support Africa, as it simultaneously promotes and proceeds with BRI. With the introduction of BRI, there are three ways China can be relevant with regard to logistics. Today we will explore the potential of all three. First, the experience of China’s logistics progress may be worth African countries exploring and emulating. Is it? China has had huge successes in logistics. Efficiency has remained stable while the markets have grown and grown, reaching more and more people across the country. And the numbers speak for themselves. Some 10 out of the 15 largest harbors in the world are in China—with Shanghai at the very top. How? Infrastructure investment from the government, direction & incentives from government, as well as strong problem solving – for example on e-commerce – which is applicable to other fast-growing poor countries. Indeed, as a Kenyan, I often find Chinese thinking and its structure of the economy somehow fairly similar. So there is a great deal of potential here. Second, Chinese companies can actively seek to enter and cooperate with local markets and partners. There are two ways they can enter local markets. First, global and cross-regional logistics is a ripe market. African countries all different. Many African countries landlocked, have different qualities/levels of ports, roads, etc. Different pricing points mean opportunities. If logistics companies can find a way to utilize existing infrastructure well, can be profitable. For instance, I just returned from Rwanda last week, where Chinese investors complain that the cost of one standard container from Mombasa or Dar es Salaam to Rwanda is around US$2000, almost equal to the cost from Shanghai to East Africa. Solving this problem for exports out of region as well as across countries in region is key. And African governments are already taking the right steps. There are currently 64 ports across the continent, many of which are being upgraded and more are being added. Other routes will be made more efficient through a new continental air transport agreement and a free trade agreement that makes the African continent the largest free trade area in the world. 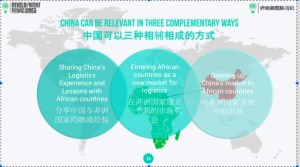 And there are many African logistics partners and Chinese companies already manufacturing in Africa for export that would benefit from partnership or investment from Chinese logistics companies. Ethiopian airlines has just agreed a partnership with DHL. A Chinese company could have done the same. Indeed, China has a vested interest in this. If better logistics can make manufacturing in Africa cheaper then it will help China’s own transition out of manufacturing and towards high-value added and services. The second opportunity for entry is internal logistics–within countries and especially cities, but there are also some urban-rural opportunities, in the same way that Alibaba’s e-commerce model has been helpful in rural areas – the “Taobao Villages”. Again, every African country logistics has different characteristics, but most are currently inefficient. There is a relative lack of internal roads – African countries generally have a quarter of the world average. There is a relative paucity of rail – Africa as a whole is considerably larger than China, but has less than half its rail network. This is not bad news. It’s good news. Think of being the first mover in a nascent market like this… If a company can use motorbikes or even drones to deliver food or other goods at scale to that proportion of the 2.5 billion people that represent the rising middle class consumers, there is a lot of profit to be made. And some cities are very attractive because they are full of young, professional people. Jumia, the continent’s best e-commerce platform is available in cities in Nigeria, and Kenya – but its no-where near as efficient as “jingling” or “waimai” because it hasn’t yet got the logistics right. Ethiopia and Nigeria are the only cities so far in the entire continent with light rail. There is so much opportunity! Let me now come to the final, third opportunity for China-Africa cooperation on logistics, China’s own opening up. Indeed, the Belt and Road Initiative is not just about China going out. It is also about what is coming into China. If factories relocate abroad, whether to make toys or shoes, they need to easily maintain the markets they had before. Logistics will be fundamental to make this happen. Yesterday we heard about blockchain being used for bringing Ecuador bananas to China. Blockchain is very interesting and important for ensuring quality and effective marketing. For example, Chinese consumers are increasingly demanding organic, clean, and unique products, and African countries are a great source for this. In fact, an Ethiopian coffee company recently used blockchain to increase its efficiency as well as gain market share by showing its consumers that it was organic and its workers had been paid well. I really urge logistics companies to not just look to Latin America or established markets like Europe or Australia in terms of higher volumes into China – look to African countries too. It is a very dynamic source market. Distinguished guests, ladies and gentlemen, thank you today for your interest in collaboration. The evidence is clear. Development cannot happen without logistics, logistics cannot happen without development. 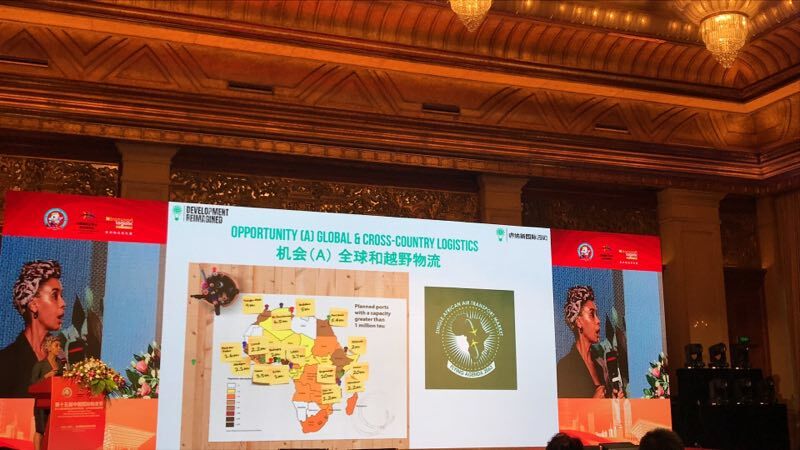 As a consultancy focused on facilitating sustainable development in Africa and elsewhere, our hope is to stimulate logistics companies and partners to join us and work towards the Belt and Road Initiative delivering a sweet spot “triple-win” partnership with logistics at the core, and poverty reduction as the ultimate goal. I am sure we will achieve it. Thank you all for your attention!